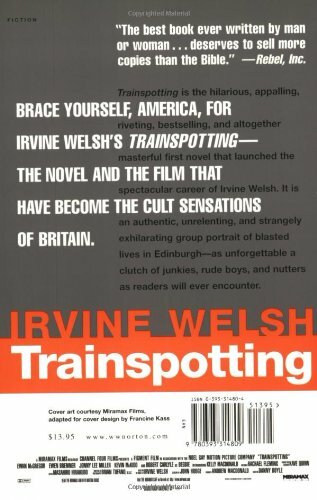 Trainspotting is the novel that first launched Irvine Welsh's spectacular career―an authentic, unrelenting, and strangely exhilarating episodic group portrait of blasted lives. It accomplished for its own time and place what Hubert Selby, Jr.'s Last Exit to Brooklyn did for his. Rents, Sick Boy, Mother Superior, Swanney, Spuds, and Seeker are as unforgettable a clutch of junkies, rude boys, and psychos as readers will ever encounter. Trainspotting was made into the 1996 cult film starring Ewan MacGregor and directed by Danny Boyle (Shallow Grave).